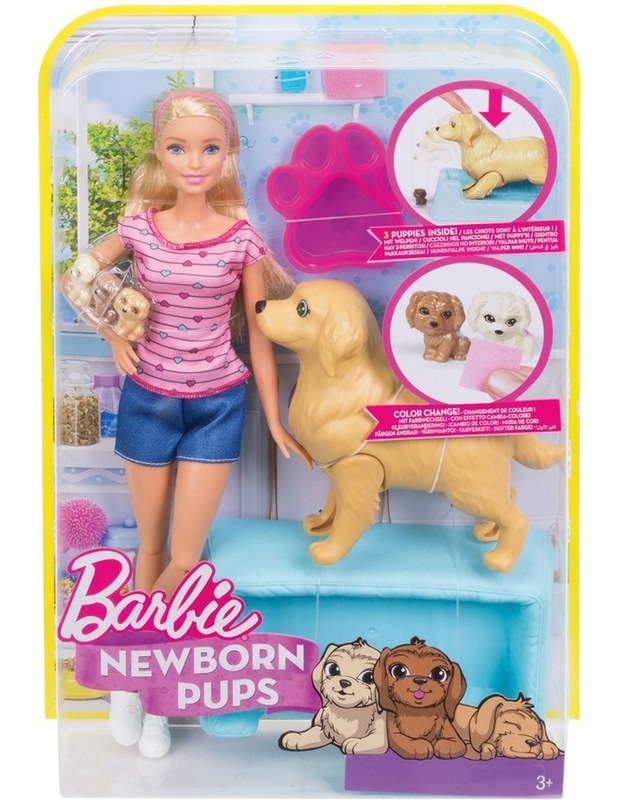 Barbie doll loves animals, and now she can help bring new puppies into the world. Surprise her adorable pet dog has puppies on the way! Help Barbie doll deliver them by pushing down on mommy dog's head. Push twice more to welcome all of the puppies! Three adorable pups each have a unique color-change feature: use the towel to apply icy water over the puppies. The action will open their eyes and reveal a colored heart. Is it a boy or girl? Barbie doll's flexible knees help her welcome and care for the new pups, and accessories inspire imagination. Mommy dog's delivery tub doubles as a puppy bed, a paw-shaped tray is perfect for bath-time and a water bottle helps clean the new puppies up for all kinds of nurturing fun. Dressed in a colorful top with graphic print, denim shorts, a matching headband and white sneakers, Barbie doll is ready for whatever young animal lovers can dream up because with Barbie, you can be anything! Includes Barbie doll wearing fashion and accessories, mommy dog, three puppies, a birthing tub/bed, paw-shaped tray, blanket and bottle. Each sold separately, subject to availability. Dolls cannot stand alone. Colors and decorations may vary.